A chance encounter between a missionary visiting the Milwaukee area and a parish priest led two very different congregations into a special relationship. Father Roger Aboteyuure from Sacred Heart Parish in Bolgatanga, Ghana was visiting the area when he sought help from Fr. Bernie Sippel, then at Pewaukee. From this meeting came a life-long friendship which led to St. Boniface parish, where Fr. Bernie was later pastor, becoming sister parish to Sacred Heart. The two parishes have become closer through a variety of activities. Visits between clergy and members of the parishes have occurred through the years. Fr. Roger, now Monsignor Aboteyuure, visited on three occasions spending time at St. Boniface meeting the parishioners, visiting the school, and preaching at masses. Beginning in 1998 members of St. Boniface visited Sacred Heart. The first group included Fr. Bernie, Deacon Jim Chrisien and other parishioners. Parish members also visited in 2005 and 2007. Deacon Jim represented St. Boniface in 2005 at Msgr. Roger’s 40thanniversary of his ordination. In 2007 a parish team visited Sacred Heart to determine how best to support the parish and school. 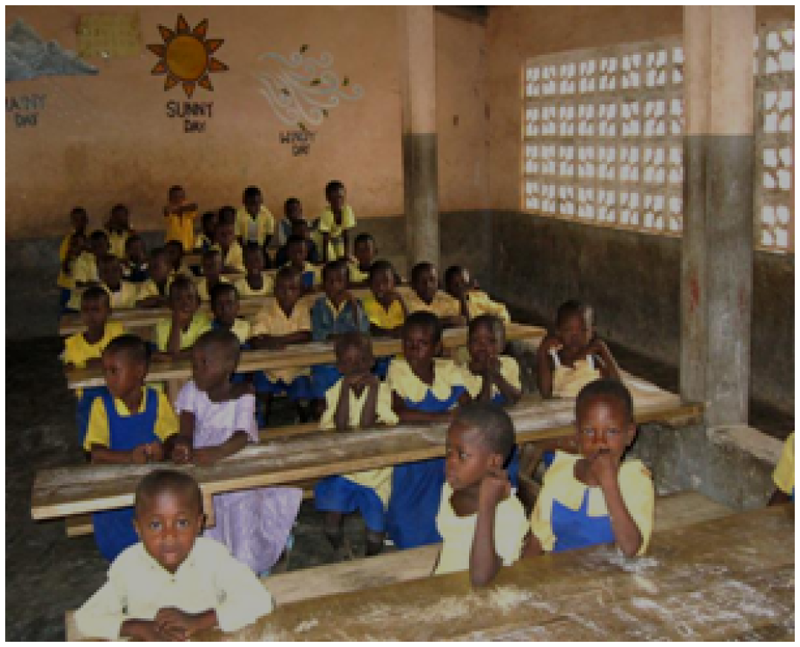 Visits were made to the parish schools, a program for orphans called Afrikids, the sick, and several parish organizations. St. Boniface supported Sacred Heart parish by sending shipping containers of needed items. The containers were packed with clothing, books, religious items, health-first aid materials and school supplies. Starting in 1998 parishioners have donated or purchased these materials and dropped them off at the parish garage where volunteers sort and box them for shipment. One of the goals of the trip the parish team made in 2007 was to try to determine what items would be of the most value. Special emphasis was made over the last several containers to provide more supplies for school children. These took the form of sandals, school supplies, solar powered calculators, primary and mid-school books, athletic equipment and art supplies. Several local companies were gracious in providing bulk supplies of paper, and the daily and weekly religious school classes made special collections for the container. Several of the eighth grade classes used this experience and decided to aid Sacred Heart as their graduation gift to the Parish. In 2003 the graduating class decided to provide a village with the precious gift of clean water. They raised money for a well to be drilled and a pump to be installed. Another class tackled the problem of providing electrical power for the clinic in Kongo, a village near Bolgatanga where Sacred Heart maintains another church called an out parish. The class originally wanted to purchase a generator to provide power, but it was felt that a better solution was to use a solar panel. The electricity created keeps emergency lights on and provides refrigeration for medicines. Based on a request from the teachers at Sacred Heart, no container was sent in 2008. Instead money was raised to provide computers for the school. This allowed the students to obtain valuable experience in keyboarding and other computer applications which will increase their employability. The main thrust of life at Sacred Heart continues to be on finishing the cathedral that was begun several years ago. 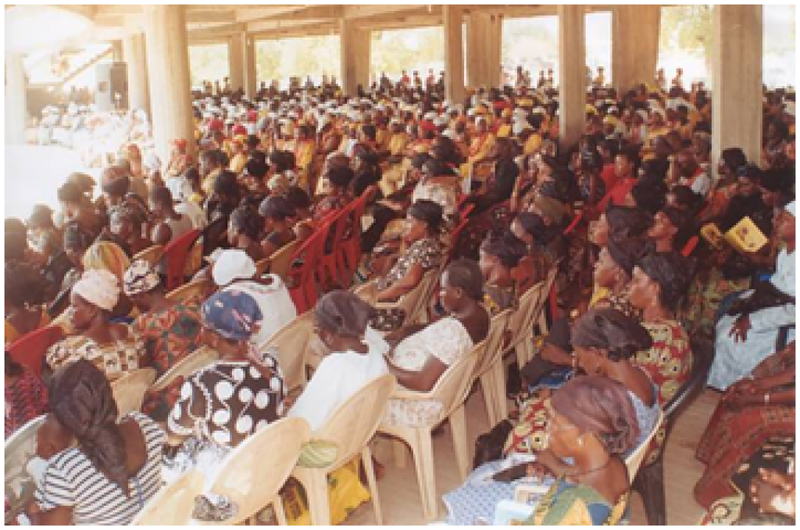 Due to the increasing size of the congregation, a church that can seat 12,000 is needed. As of 2007 the first and second floor has been poured, and work is beginning on the roof. When the parish team visited in 2007, they witnessed the volunteer work being done by the Christian Women who donate one day a month to work on the cathedral. The women were carrying flat buckets containing wet cement up a one story ramp to dump them over the reinforcing steel and the forms for the second floor. Msgr. 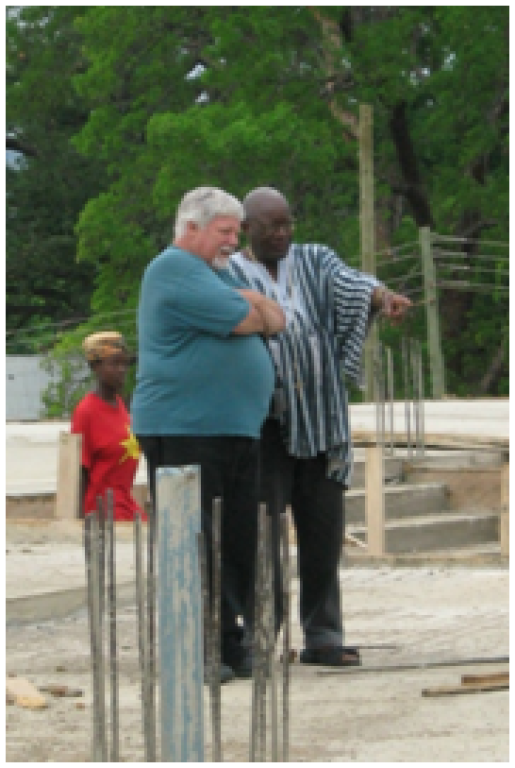 Roger Aboteyuure of Sacred Heart Parish continues to need help with all of his projects. Last year we collected money to buy chairs for our Sister Parish’s new Cathedral. He was so pleased with our gift. He recently hosted an Episcopal ordination at the Cathedral which had approximately 15,000 people attending. He noted that many of the chairs were the ones St. Boniface financed. The Cathedral does not have a roof yet, but he has purchased some of the materials needed. In addition to trying to finish the new Sacred Heart Cathedral, he continues to dig wells so his people have safe drinking water, and build new schools on Sacred Heart Campus as well as in out-parishes, areas outside of Sacred Heart Parish grounds. 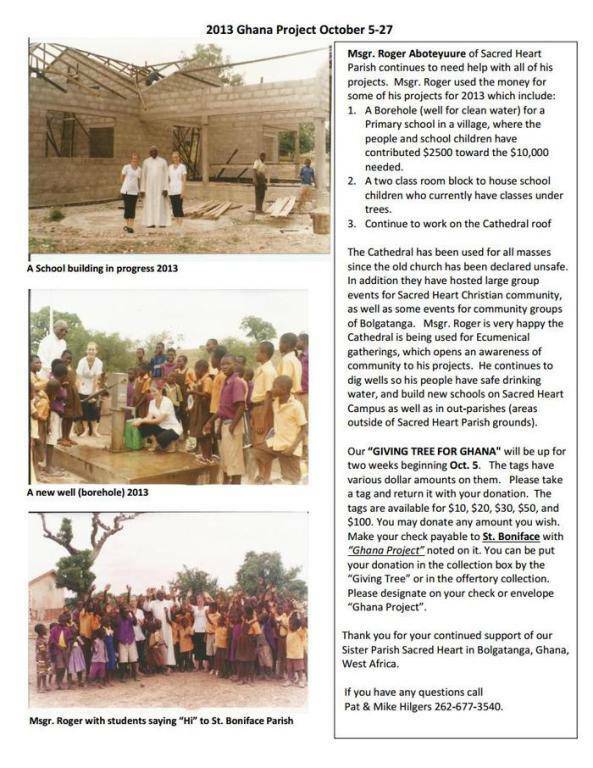 These are just a few of the many projects Msgr Roger is involved in. Msgr. Roger sent some photos of the Easter services at Sacred Heart. They baptized 1250 adults on Holy Saturday morning. Normally this would have been done during the Vigil Mass but with a group this big that would have proved unworkable. The sacrament was the completion of the two year Rite of Christian Initiation of Adults program. Palm Sunday, Holy Saturday, and Easter Sunday masses were all held in the cathedral. There still is a great deal of work to be done to the cathedral before it is completed. Much of this work will require skilled tradesmen and is not work that can be completed by volunteers. The most expensive part will likely be the roof which, since it needs to span the width of the church, will have to be steel, costly to fabricate and ship to Bolgatanga. The roof is designed to mirror the style of the traditional meeting huts which dot the countryside. It features a high, steep slooping floor which funnels heat up and away from the people seated below. Recent plans call for the installation of a holding facility for the rain run-off to be stored for use during the dry season. When it is finished the cathedral will seat 12,000, a necessary size considering the more than 7,000 parishioners that were there for Easter services this year. For some time members of the Human Concerns Committee had been hoping that Msgr. Roger would come to the States to visit the parish again. In November he was able to coordinate a stay in Germantown with visits with friends in the Montreal-Quebec area where he had attended the seminary, New Jersey, and California. He arrived here on November 1st. and over the next four weeks he was very busy. No visit to the Milwaukee area would be complete without a visit to the Harley-Davidson Museum. Msgr. Roger also visited the Art Museum, a local manufacturing plant, a parishioner’s farm, the Basilica at Holy Hill, and the state capitol building in Madison. Being back in the Milwaukee area also allowed him to renew his friendship with members of the Archdiocese World Mission Office. The Human Concerns Committee invited him to a work session where he helped make tags for Christmas Giving Tree. Both the St. Vincent DePaul Society and the Christian Women’s Society took the opportunity to have him attend their meetings. He also toured the St. Vincent DePaul Society store in Slinger. Visiting and sightseeing were pleasant, but Msgr. Roger’s goal in coming was to meet and interact with the children and adults of St. Boniface. Over the period of several weeks he was able to visit all of the grades at the day school. Typically he would talk a bit to each class and then answer questions the students had about Sacred Heart Parish. Part of each meeting was teaching the students a few words of Gurune, the language spoken in Bolgatanga. In addition to visiting the day school, Msgr. Roger also spoke to the Wednesday and Sunday Faith Formation classes. Msgr. Roger also wanted to share with adult parishioners more about our sister parish in Ghana. He was able to concelebrate daily and weekend masses with Fr. Todd and preached at the masses on November 14-15. In addition to the meetings he attended and classes he visited, Msgr. Roger shared a number of meals with parishioners and also visited Repairers of the Breach, where he participated in their scripture discussion and bag lunch. Msgr. Roger left St. Boniface on December 2nd. After a brief stay in California, he spent time in Montreal at the Seminary where he was ordained, leaving there for the return trip to Bolgatanga. When parishioners visited Sacred Heart parish in 2007, they were made aware of a problem facing graduating students. At the end of the eighth grade, pupils are given a national test. Based on the results of these tests, higher achieving students are provided the opportunity to continue their education at a variety of secondary schools with tuition and expenses paid by the state. However, to qualify the students need to provide an initial payment of around $100. While the families of some students are able to raise this amount, many are not. Fr. Moses, the pastor of Sacred Heart, discussed this situation with the parish representatives. The discussion turned to the idea of individual members of the St. Boniface parish being given the opportunity to sponsor a student selected by the staff at the schools comprising Sacred Heart’s roughly 5,000 students. Fr. 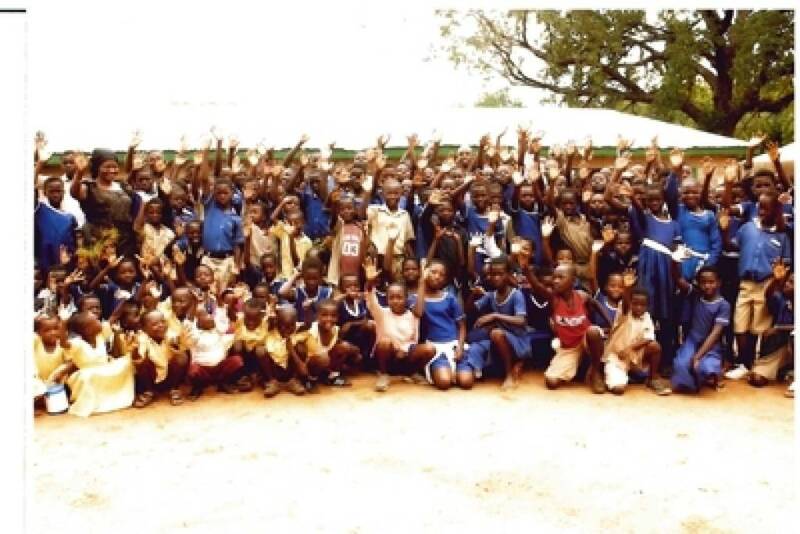 Moses pointed out that while the sponsorship would pay the initial cost to send the student to a secondary school, the students’ families would still be expected to provide support. Msg. Roger refers to this as the “widow’s mite”—a reference to the idea from Mark and Luke that even the poorest person must contribute to their own support in some way. As a result of this discussion, when the representatives returned to our parish, they added this sponsorship opportunity to the annual appeal made for our sister parish. Twenty-three parishioners chose to sponsor a student. Because of differences in the school year these sponsorships weren’t presented until 2008, and each of the sponsors received a thank-you from Msg. Roger. In the future it is hoped that the students will become involved in communication with the sponsors. Several of the sponsors contacted the Human Concerns committee asking if they could continue their relationship with Sacred Heart Parish. The result from this year’s drive was a testimony to the generosity of our Parish. There was an initial worry that the recent world-wide economic downturn would dampen the success that we had last year, but apparently that fact didn’t hinder the feelings St. Boniface has for its sister parish. Forty-one people responded to the appeal raising $4235. A check for this amount was mailed to Msgr, Roger on July 3. He was notified by e-mail that the check was on the way so that the selection of the recipients could begin. In his response on July 10 he was gratified by our response saying “I am so impressed and touched by the gesture of this donation.” Thank-you notes were sent to all the people who contributed to the sponsorships.